Completely remodeled, Beautiful condo in a 5 Star Condo Hotel building in Sunny Isles Beach, Florida. There is a king size bed in the bedroom and a pull-out couch in the living room, comfortably accommodates 4 people. Wide balcony and floor to ceiling windows overlooking the ocean, city and the inter-coastal. Unit contains everything you need to feel as though at home; fully stacked kitchen, linens, towels, WiFi. Located in the heart of Miami Beaches, just 25 minutes from Miami international and Fort Lauderdale Airports, Port of Miami and South Beach. Included are many amenities, such as: • Private beach •Zero-entry beach side pool •Two outdoor Jacuzzis • Steam and sauna rooms •European-style spa •State-of-the-art fitness center • A world-class restaurant with oceanfront terrace •Cafe• Convenience store • Spectacular meeting rooms •Comprehensive guest services. 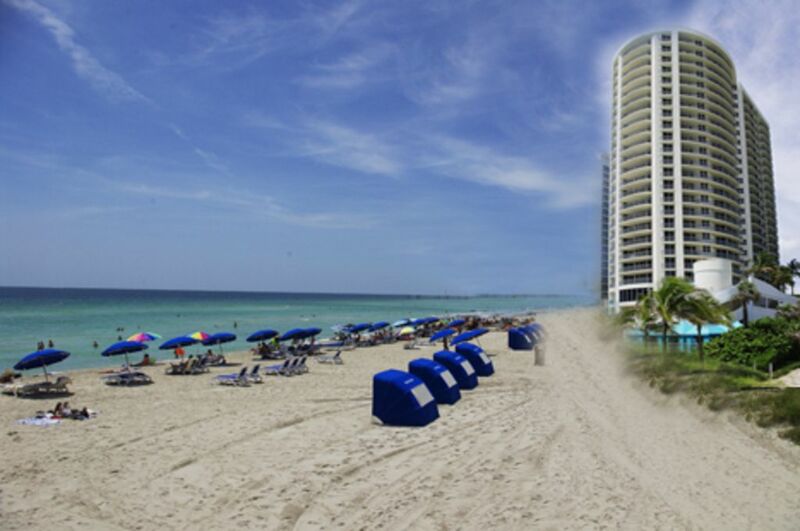 This condo is well situated on the beach in Sunny Isles. The condo is spacious however in desperate need of an update and some repairs. The front door handle was quite loose and concerning and the balcony door did not lock. The microwave was broken and there were some questionable critters seen in the kitchen. Hotel staff and property manager were very pleasant and helpful. Update: The condo was completely remodeled in May 2017. I was very saddened to learn the guests were so disappointed in the condo. This is truly the first time when something like this has happened. Unfortunately we only found out about the problem when the guests were about to leave. Had we been informed from the beginning, everything would have been fixed and done immediately. Needless to say, all of the issues were taken care of right after the guests left. The condo is in a very pristine condition and waiting to be occupied. Welcome to our little paradise! And don't ever hesitate to let us know if there is anything we can do to make your stay even more pleasant and enjoyable! The Condo was in excellent condition, all was according to the description. The sunrise over the ocean seen from bedroom, living room and balcony is amazing. Owner was very service minded and answered all requests immidiately over e-mail. All you need for a vacation is in the condo or in building, we really appreciated the full equipped kitchen, the washing/dryer, the gym, beach and pool area. To our surprise the restaurant at bottom floor was quite empty, we had dinner there once and we were alone in restaurant. We will consider this condo going back to Southern Florida, and can consider spending more time than the two weeks we spent over Christmas and New Year this time. The only small downside I can think of is that the sun is shadowed by the next door house from 10 am to 3.30 pm, but if you need more sun go to pool. This condo has all the amenities that were described in the listing. The best part was free parking as you are renting a private unit. The owner was prompt and provided all the answers required prior to renting. The place has everything you need to enjoy the beach. Beach chairs and umbrellas rent for 10$ a day at the resort but were available for us to use for no charge in the condo by the owner (smaller chairs but they work just fine). There were beach toys for kids. Kitchen is well equipped with coffee maker, microwave, utensils and cutlery and kept very clean. I wish there was Wi-Fi available in the condo but we could go downstairs and use the computer center with a printer available for printing so I have no complaints. The location is perfect for a vacation with a family or a group of friends who want to enjoy the ocean. We were looking for a place to stay with a kitchen so this was exactly what we needed as our son is a picky eater. Thank for you for making our vacation perfect. We will come back for sure!!! I stayed in the condo for a month and it was wonderful. Only down side was there was no phone (of course we have cell phones) and the queen sleeper needs updated. I hope to spend another month here in 2011. Michael (the agent who rented me the property) was so helpful and the Doubletree staff was just wonderful. Really emjoyed the ease of the spa too. The best vacation I ever had. Very nice property with a beautiful view. Why pay full retail for the same room through Doubletree when you can save and rent this property through the owner. Property was as described. It's a great location with two supermarkets, drug store and multiple bars and restaurants with in walking distance. Sunny Isles Beach, the City of Sun and Sea, is located on a barrier island in the northeast corner of Miami-Dade County, bounded by the Atlantic Ocean on the east and the Intracoastal Waterway on the west. Sunny Isles Beach is midway between downtown Miami and Fort Lauderdale with easy access to business centers, entertainment, sports and recreational facilities, and tourist attractions. Almost one million vacationers visit Sunny Isles Beach annually to enjoy the 2 ½ mile-long fine sand beach and outdoor amenities such as water sports, boating, fishing, and tennis as well as the abundant shopping, dining and entertainment options nearby. The landmark fishing pier is a local favorite while the beautiful Samson Oceanfront Park provides a children's play area and space to relax; meet friends and enjoy the sunrise. You will enjoy the best of the bustling city without the hassle of city life. Minutes away from 'art deco south beach' with its rich, wild, exclusive, famous lifestyle. Rates are subject to change until dates are confirmed. Minimum stay is 3 months.